Let's say for example that you were planning on projecting a custom monogram onto a wall, but when you show up to your venue on your event date you realize that the wall option is not going to work. This situation happened to one of our rental clients in Florida. He rented 24 uplights, a custom monogram projector, plus a standard projector mount and a stand. 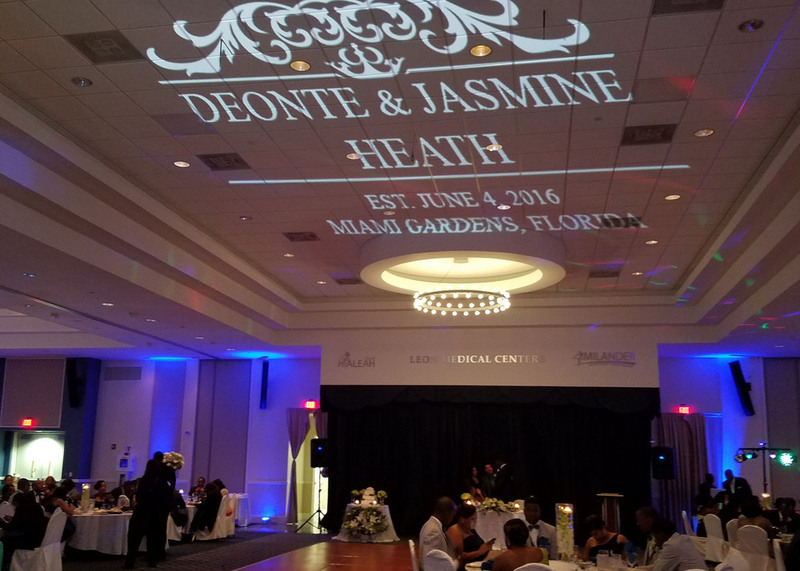 His plan was to aim the projection towards a wall inside the ballroom at the Milander Center for the Arts & Entertainment in Hialeah, FL but ran into some issues while setting up with the available space. The only option was the ceiling. This is how he did it: "I used your stand and a 3-inch ring binder. I then used the settings on the lens of projector to complete the angle." Nice way to improvise using what was available to come up with a great solution! Adjust the settings on the projector to achieve the desired angle.